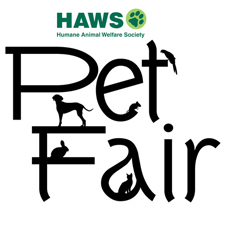 Date/time: Saturday, August 18, 2018 / 9:00 a.m. – 4:00 p.m.
GPA-WI is participating in the 2018 HAWS Pet Fair in Menomonee Falls! This pet-friendly event offers games and activities for both two-legged and four-legged guests. Guests can shop local vendors for pet products and services, talk with pet experts, watch a Police K9 demo, play games, participate in raffles, and meet with pets from HAWS and its rescue partners. 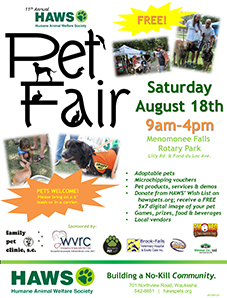 GPA-WI is proud to be a rescue partner of HAWS and will have a booth set up at the pet fair. With GPA-WI participating in the event, the Menomonee Falls community can learn how “greyt” greyhounds really are! Stop by the GPA-WI booth at the pet fair to catch up with other greyhound lovers, meet greyhounds in person and help spread the word about greyhound adoption. Admission is free! Pets attending the event must be kept on a 6′ leash.